Shares of the tech giant plunged on a weak earnings report and a questionable acquisition. Here's what you need to know. 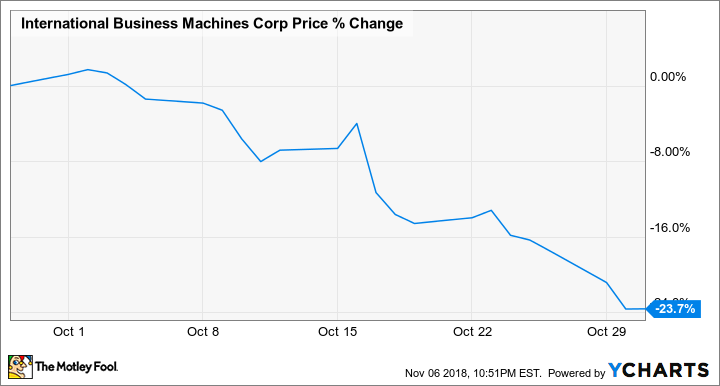 Shares of International Business Machines Corporation (NYSE:IBM) dived again last month. The legacy tech giant put up another disappointing earnings report, with revenue growth turning negative again, and investors pooh-poohed its high-priced acquisition of Red Hat (NYSE:RHT) toward the end of the month. According to data from S&P Global Market Intelligence, the stock finished October down 24%. As the chart below shows, it fell consistently over the course of the month, though there were notable dips on the events described above. IBM stock was already down several points for the month when the company reported earnings after hours on Oct. 16, and a disappointing report led the stock to fall 8% the next day. The company saw revenue fall 2% to $18.8 billion, which missed estimates at $19.1 billion, marking a return to shrinking revenue after it snapped a 20-quarter streak of revenue declines earlier this year. That's a sign that growth in its strategic initiatives like cloud computing and artificial intelligence has not been fast enough to counteract declines in its legacy hardware business. Gross margin was flat in the quarter at 47.4%, and adjusted earnings per share increased 5% to $3.42, though that was largely driven by a lower tax rate and fewer shares outstanding as pre-tax income was up just 1%. That indicates that IBM's strategy of pivoting to higher-margin services is not delivering the expected results on the bottom line. Then, the stock fell another 8% over a two-day span late in the month after the company said it would acquire Red Hat, a provider of enterprise open-source cloud solutions, for $34 billion, including debt. Investors seemed to balk at the price tag, which was a 62% premium over its closing price in the prior session, and some questioned CEO Ginni Rometty's judgment on the move, as she has presided over a long slide in the stock price. IBM's guidance for the full year also did not inspire confidence, as the company sees adjusted EPS rising just 1% to $13.80, despite the benefit of tax reform and fewer shares outstanding. Shares of Big Blue now trade at a dirt cheap P/E ratio of just 9, and it offers a dividend yield of 5.4%. But the company's consistent inability to deliver growth in earnings or revenue over the last several years explains why it's so cheap. Perhaps a change in management would be the best way to unlock its value.